Double Seat Movie Review: Is the ride worth it? Marathi movie makers in recent times are choosing hatke topics, be it Poshter Boyz, Court, Killa or the recently released Shutter. This is obviously a welcome change as we all were quite bored with the monotony that Bharat Jadhav and Makrand Anaspure brought to Marathi cinema. Double Seat does not deal with a way too hatke a topic though. The trailer looked promising, but does the film deliver? Read on to find out my views. To start off, Double Seat is a misleading title (rather a non- leading title); it divulges very little about what the movie has in store. The theme of the movie is simple and surprisingly not many filmmakers have tried exploring this. It deals with the struggle of a middle class couple trying to find a home in the city of Mumbai. The first half is really nice. 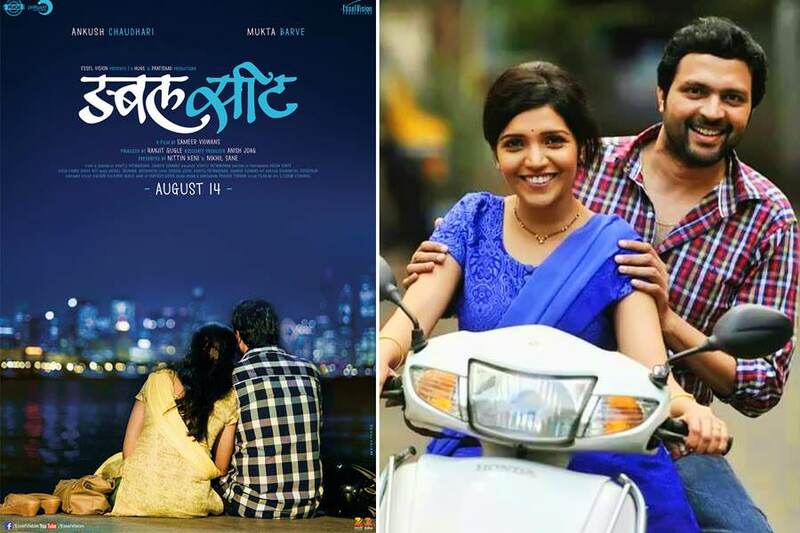 The immediate-post-marriage romance between the lead couple Amit and Manjiri, played by Ankush Choudhary and Mukta Barve is presented in a nice format; especially their conversations on SMS are quite cute. The problems that they face while living in a small room in a typical Lalbaug chawl are well depicted. The director has paid attention to detail and these problems are something which every Mumbaikar has faced, be it the disappointment they feel when they fail to get some private time or like when Mukta Barve is embarrassed to be intimate when there are too many people just outside their door or when Ankush feels for his wife when he sees her standing in the queue for the common toilet. All is well till the first half. The second half shows the difficulties they face in getting a home, the out-of-budget property rates, opposition from Ankush’s father, and the hurdles they face in the end. They eventually do succeed in their efforts with help from their family despite a few hiccups. My main issue with the film is the relation between Ankush and his father. The conversations they have are form an important aspect of the movie but they fail to emote. I enjoyed all the highs of the movie but the lows were terrible. I don’t know whether they were the dialogs or were it the performance, but I never seemed to connect with those parts of the movie wherein Ankush argues with his father or when he tries to vent out in the end. Coming to performances, Mukta Barve is excellent as always. Ankush does match her quite well too and their chemistry is quite engaging, especially in the first half. Vandana Gupte as his mother is also good. As I mentioned earlier, Vidyadhar Joshi (Amit’s father) seemed a misfit (accepted that he is a senior actor but somehow I felt so. And it’s my personal opinion to which everyone may not agree). Sandeep Pathak and Pushkar Shrotri have been given small roles which don’t do justice to their acting abilities. Although the film is centred on Amit and Manjiri’s efforts of buying their own house, the director uses this to give us a glimpse into the life of a middle class Mumbaikar and the routine struggles he faces. And that he manages really well and hence the movie seems believable in most parts. These are incidents which most of us could relate to. One recurring theme in the movie is taking the leap of faith and pushing ourselves out of our comfort zone. Also how important is to have someone to push us to take that leap and supports us while we do that. This is something I loved to take back from the movie. Overall the movie says a lot in the simplest and quite believable ways. Do take the leap of faith and catch this one in the theatres.